Sadly nothing to do with life in a fast-paced newspaper office or a slot dedicated to attractive octopuses, Microgaming's online slot title Hot Ink is all about the world of tattoos. Utilizing Microgaming's 1,024-ways to win payout system, wins are plenty - even if you're playing at the lower end of the betting spectrum - and the reels are beautiful to look at. If you have ever watched the hit US television show of the same name then you will know what the Hot Ink theme is all about. You might not even like the idea of tattoos but with 1,024 ways to win, it's worth putting your thoughts to one side for this slot. As you'd expect from a slot set in a tattoo parlor, the icons are presented in tattoo form, with a nice skin color in the background. Therefore we get tattoo icons of flaming dice, 8-ball cherries, a lucky horseshoe, a devil's heart with wings, and two fighting fish. The tattoo artist sits proudly staring out at you, as does his female customer. What immediately sets this game apart is the Re-spin feature that is offered in the base game. After a spin you'll get a chance to re-spin any reel of your choice for a coin fee. It lends itself well to those players who can work out whether it's worth a gamble in order to re-spin and complete that winning combo or not. The Hot Ink logo acts Wild and subs for all regular symbols other than the Scatters. Five Wilds across the reels awards a 1,000x coin jackpot. Look out too for the two women symbols, as combos of the blonde and brunette award you more coins. 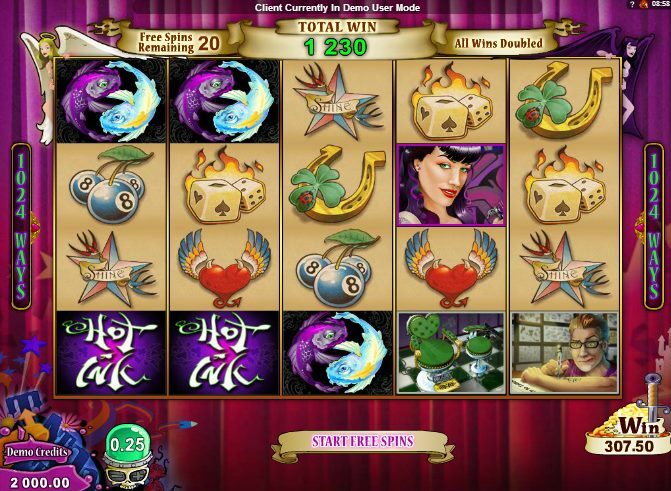 Three or more Scattered fish tattoos triggers a free spins with 20 at 2x up for grabs. They can also be re-triggered during the free spins round. Three or more Tattoo Bonus symbols across the reels triggers the Tattoo Bonus round. Essentially a Pick ‘em Bonus round (with tattoos) you get to click each album in order to reveal a combination of tattoos and win a prize. 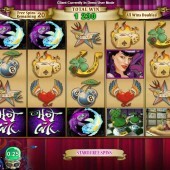 If all three tattoos complete a set you'll win 10 free spins with a 2x multiplier. It’s great-looking, it’s original, and there are some nice free spins up for grabs – there’s little to dissuade the average punter here, although the 1024-ways system will mean you’re probably bagging plenty of small wins en route to hitting the jackpot. That said, if it’s your first taste of 1024 ways-to-win slots, and it’s left you wanting more, take a look at Arctic Fortune, Microgaming’s Nordic-tinged slot, while IGT’s summery slot, Garden Party, also offers the same betting system.